Scott here, and welcome to my podcast. Each week, I publish new episodes for entrepreneurs looking to scale to 7+ figures, so they can become the Coca Cola of their industry and lead a life of true abundance. Each new episode appears here, but I publish them first on iTunes. So if you want to get advanced access before anyone else, Subscribe to the show now! … which results in super-profitable 7-figure business that allows abundance, freedom, impact and fulfillment. When it comes to growing businesses Scott understands the key elements, since knowing him I’ve not just understood marketing in a better way, however, his insight and rich knowledge is nothing short from amazing. I’ve been working with him for nearly a year and it just keeps getting better. Scott’s helped me increase my revenue, while decreasing the complexity of my business, this has allowed me to take more time off, have less staff and a higher bottom-line profit margin. You can’t ask for more than that. Scott talks about helping people that are at 7-figures all the time. However, the funny thing is, I started using his advice when I was at zero. Now, I’m generating over 6-figures a month, while living my dream life in Thailand… just 16 months after meeting him. Since working with Scott, I’ve 4x’d the revenue of my business. When it comes to being able to help me scale to $10,000,000/year, Scott is the guy I’m trusting to help me up the mountain. Wouldn’t it be great if you had predictability in your business AND you were able to grow the business? Scott has guided us to being able to 4x our revenue, increasing our profit margin, gaining leverage and implementing a level of sustainability. It’s an entirely new level. 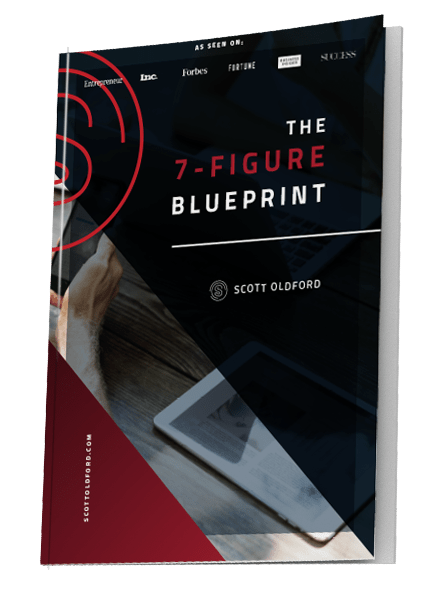 Through using Scott’s process, I’ve been able to build my business from generating low five-figures per month to now generating multiple six-figures, each and every month in a completely predictable way. It isn’t easy, however, great things aren’t easy. I was already generating 7-figures with my business, however, I wanted to start a new one in a brand new marketing and niche. Scott helped me get to $50,000/mo in a matter of 3 months from essentially zero. He understands what it takes and it isn’t just theory, but true action. I follow very few of those who I meet online. Further, I’m friends with even less. From the first time I saw one of Scott’s Facebook Ads, I knew something was different. Scott not only has been there and done it, however, he has the ability to help you exactly on the path you’re on. He’s made me a LOT of money. I’ve built an 8-figure business, however, when I wanted to grow in a brand new market and use the online world to grow it, I knew who I needed to work with. Working with Scott’s methodology for growing businesses is a little bit of magic, he has a weird ability to compress years of experience in less than 10 minutes. If you want a human being that’s going to be able to actually offer actionable advice that’s not just based on theory, you’ll want to work with Scott. After spending over 10 days in his presence, I can safely say, If you’re scaling and growing your art, he’ll help you create a massive amount of momentum without selling your soul while doing it. Scott and I connected because of a Facebook Ad. Now 2 years later, he’s still one of the top people who has helped us grow, while keeping our freedom inside our business. I consider Scott a Unicorn, I’ve never seen someone enjoy their work and understand the game of business better.